Manchester United targeting Axel Witsel Manchester United have been linked with another midfielder Axel Witsel for the summer move, according to Metro. Manchester United are now targeting another midfielder Axel Witsel for the summer move, according to latest reports. The Metro reported that the Red Devils have added Axel Witsel to their transfer list despite of closing on Ilkay Gundogan move. United have been in link with Borussia Dortmund star Ilkay Gundogan since last summer and the recent week’s reports have claimed that his move is now coming closer every day. While, current midfielders Ander Herrera, Marouane Fellaini and Michael Carrick all have been impressive for the Red Devils. 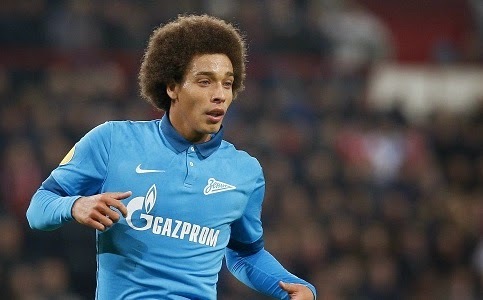 But still the Dutch boss LVG is eyeing to strengthen his midfield..
Witsel who plays for Russian side Zenit St Petersburg is also planning to leave for the Premier League football. The Belgian player could make a fine partnership with his countryman Fellaini. He hinted a move by saying that he loves Premier League and wants to play in it. The 26-year-old is a versatile player, he can play in variety of midfield positions. Untied boss Louis van Gaal who is eyeing to fight for the Premier League title next season will also be selling several of his players including Tom Cleverley who is currently on loan at Aston Villa.